He’s a dog and military killing machine, but what they don’t know is that he truly has feelings of his own as he runs away from the military training he is accustomed to and finds refuge with two unwitting teens who need AXL just as must as he needs them. Now the question is, will the teens be able to keep the dog safe without the military finding him? The problem is the military is watching at all times and knows just how long the dog will stay before they take him back. Subsequently, A-X-L also stars Latin star Becky G, who is most known for her music videos and most recently for role in Power Rangers as Trini (Yellow Rangers). In A-X-L she comes off as the same sideline character taking on much of the characteristics that we saw in the recent Power Rangers remake where she is the one that can take care of herself; however, an element of love is added with the chemistry between Neustaedter when the two must protect the dog together in their custody. Overall, it is a smooth connection that ultimately drives the dynamic between the two and makes the struggle to keep AXL that much more real. Being only the second time we have scene Becky G as a non-musical icon, it is encouraging to watch her transformation from pop star to movie star. 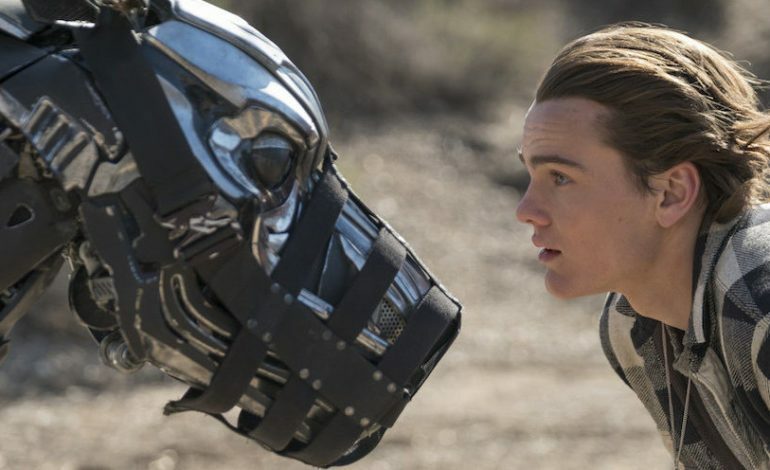 The initial story of a robot dog seeking refuge after a military operative goes wrong is not a truly original concept, one could compare the movie for that of Terminator or A-I with Haley Joel Osment. There are definitely elements of both as one looks at the military aspect and that of a robot advancing through the constant need of human contact. That being said, there are other elements where A-X-L stands out as something that has never been done and that is taking a teenager and putting him in competition with the military operative for the sake of saving his best friend/robot dog. That, and the fact that both Artificial Intelligence as well as the Terminator franchise came out 2001 or 1984 for Terminator, perhaps the director is hoping to attract audiences with a reminder of just how exceptional robots could be in this day in age. However the idea of man and dog relationship was explored in another movie earlier this year through Isle of Dogs, where one saw from the dog’s point of view what its like to be caught in a military atmosphere when a young child needs help. While the teens in A-X-L aren’t nearly as helpless, there is still the same chemistry and justification of the bonds between canines and their owners. Even being a robot dog, the same elements are there and through A-X-L the notion is fully flushed out into the fact that even robots can have the same characteristics as the furry 4-legged friend. While not an entirely original storyline, A-X-L is still a movie to experience as it combines elements of past movies, to create an all new version for a new audience. It includes exceptional acting by relatively new actors in a way that makes one interested to see where they will go from here and it has one rooting for the robot dog named AXL who just wishes to be a regular dog rather than Attack, Exploration and Logistics machine.